“Clean sheets get points” has been the mantra for half the managers in the world, whilst the other half firmly believe that attack is the best form of defence. It’s safe to say that Marítimo manager Daniel Ramos is firmly in the formers camp. So far this season Marítimo’s games have averaged 1.57 goals per game – far below the league average of 2.29 goals per game, incredibly this has equated to an average of 1.36 points per game putting them in the hugely impressive position of 6th. Marítimo have managed to only concede 17 goals in their 23 games played the lowest in the league behind heavyweights Porto (11 conceded) and Benfica (13 conceded) which for a side that is typically an upper mid-table side is hugely impressive – especially taking into account 6 of the goals (35%) Marítimo conceded were in 3 games against Sporting + Porto – results to be somewhat expected. However, whilst researching how exactly they’ve achieved this, something else caught my eye and the focus of my analysis switched – I was watching every goal Marítimo have scored this season and noticed that they score an absurd amount of goals from set-pieces, and by absurd I mean 68% of their goals scored in the league so far this season have come from set-pieces (13 set-piece goals from 19 goals scored)! Apart from the huge number of goals from set-pieces in general, there’s one number there that firmly sticks out. The corner/goal ratio is ridiculous, taking into consideration Marítimo have taken 97 corners in their 23 games so far this season, this gives them a goal-to-corner “success” rate of 8% – a whopping 5% above the widely accepted average ratio of corner to goal which is around 3%. Is this simply just good fortune or are Marítimo exploiting something that me and a growing number of people in football think are undervalued – the importance of good set piece routines? Let’s have a look at how they set-up from each corner that led to a goal to work out how exactly they’re averaging almost a goal every 3 games from corners. Here we have 2 angles, along with the rough positions of each team’s players (Marítimo in yellow, Tondela in green) for the corner. Tondela looked to be implementing a mix of zonal and man to man marking with interestingly with 2 men on the diminutive (5”8) Alex Soares on the front of the 6 yard box. Surprisingly there wasn’t much movement from the Marítimo players, with Alex Soares making a run in-between his 2 markers towards the corner taker – dragging a Tondela player with him. The cluster of players at the back post edged slowly towards the 6 yard box (with the flight of the ball) before centre-back Raúl Silva (number 34) rose up to head home his 4th goal of the season. Silva is always going to pose a goal threat from corners (6”3) – as is striker Dyego Sousa (6”2) so it’s no surprise that Marítimo opted to bunch them together. Overall I’d say this was poor defending from Tondela, with two defenders not jumping with Silva and Sousa, essentially allowing a free header. Here we see Paços de Ferreira (in yellow) facing a Marítimo (in green) corner early on in the match. Paços de Ferreira are operating a zonal marking system that focuses on defending the 6 yard box, creating a very obvious square shaped defensive perimeter around the goalkeeper. Interestingly as the corner is taken the 2 Paços de Ferreira players near the post push out – presumably to try to play the offside trap against the Marítimo number 6 if the ball falls to him. The main Marítimo threat is again Silva and Sousa (numbers 34 and 9) who take up similar positions to the last corner we looked at. They’re basically left unmarked with just the one Paços de Ferreira player marking three of them. As the corner is taken the 2 Paços players on the 6 yard box move forward to intercept the cross but it’s too late and Silva has had time to expertly guide his header into the far corner. Whilst the idea from Paços de Ferreira was an interesting one, leaving just one player man-marking the trio of Silva, Sousa and Maurício wasn’t the brightest of ideas – even when you know the ball is likely to put into that area and have players running out to attack that area due to the precision of timing needed. Above I’ve labelled 2 Paços de Ferreira players. The player labelled as number 1 is in a pointless position, he’s guarding the front post when 2 others are doing the same job. It’s obvious the Marítimo number 4 will be making a run into that area, but if the Paços player (labelled 2) man marks him and follows the run into that space then you aren’t losing any defensive cover allowing the Paços number 1 to be re-allocated somewhere else – ideally in the area occupied by Sousa and Silva to balance out the numbers in that zone. Conceding a goal from a corner when you have every player in the box defending should NOT happen! Estoril have adopted a mixed approach to this corner, although they’re primarily adopting a man to man marking system, with a few other key areas being marked zonally (such as the front post and edge of 6 yard box). With no Sousa on the pitch, the 4 Marítimo players grouped together consisted of Silva, Fransergio, Djoussé and Maurício. Estoril were grappling with the Marítimo players which forced a re-take, but Marítimo still executed the same routine. Most of the Marítimo players remained static, except for Silva who on his run into the front of the 6 yard box lost for marker and glanced his header into the bottom corner. In the pictures above, you can see the goalscorer marked as the Marítimo number 3 (Maurício), sitting all by himself towards the far post. The Feirense zonal system is positionally set-up pretty well, despite being simple – A line across the 6 yard box with a man guarding front-post. 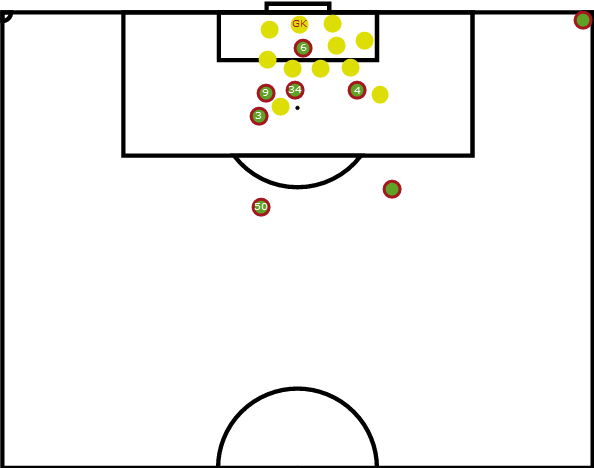 The major downside is the lack of awareness that the Feirense system has – despite Maurício being in acres of space – nobody is aware of it as they’re all facing the corner, therefore having their backs to Maurício – allowing him to drift into a little pocket of space and by the time the Feirense players have turned around to face where the ball is landing, it’s already resulted in a goal. The 2 far players on the 6 yard box closest to Maurício definitely should be facing outwards towards Maurício and be looking to attack that space around him then they’d have a relatively solid defensive system in place. Feirense again lined up in their zonal marking line system as shown previously, Maurício is again the goalscorer and once more takes the area at the back post (labelled 3). This time however the corner comes to the near post where Deyvison (labelled 4) flicks it on, whilst Maurício runs towards the back post and headers it in from a couple of yards. The Feirense players were furious with one of their own for this header as Deyvison only managed to get a flick after the Feirense player marking him mis-timed his run meaning the ball sailed over his head for a simple flick-on to the back post. Better defending than the first goal, but also quite a fortunate break for Marítimo. Benfica were obviously aware of the set-piece danger that Marítimo posed so opted to have every single player inside the box and seemed to favour a zonal marking system. Fransergio (labelled as 35) made a run in towards the 6 yard box but it was Maurício (number 3) who barely had to move as he headed in from near range. A simple goal and one that probably cost Benfica the match. Vitória Setúbal lined themselves up in a zonal system, with one man on the front post, another on the edge of the box and the rest either lined up on the edge of the 6 yard box or grouped in with the Marítimo players. As the ball is whipped in the Marítimo players edge forward and break ranks slightly, with Souza attacking the slight gap at the end of the Vitória wall on the 6 yard box, he’s rewarded with a header that flies into the bottom corner. In a similar style to the earlier Feirense goal the players are watching the ball (as you are supposed to do when marking zonally) this has the disadvantage of not knowing when a player is a making a run into your zone, particularly when he’s attacking from behind as is the case in this situation and in the end is a well worked corner and a simple goal. An interesting start to this routine that I don’t recall seeing too often. As you can see via the pictures, there are 2 Marítimo players over the corner, the player nearest the by-line runs past his team-mate without touching the ball, whilst his team-mate then whips in an out-swinging corner with his left foot. This tactic confuses and delays the Tondela players just a fraction, but enough time for Sousa to push his marker away to create a bit of space to head home. Tondela were the first corner we analysed earlier on in the article and it’s easy to see that their shape hasn’t altered too much, still focusing on the zonal marking of the 6 yard box. Silva (number 34) also makes a completely untracked run through the 2 players on the edge of the 6 yard box and if the corner had fallen a bit short, i’m confident that would’ve ended in a goal as well. I went into this article with the aim of finding out whether Marítimo had been practising set-piece routines obsessively or had just been performing slightly above average (an outlier) and it’s still quite hard to tell. On one hand some of the defending has been poor, or Marítimo have been fortunate with a couple of them, but on the other it’s clear that a fair amount of work has gone into them as well. It’s obvious to see from the above examples that some players are often involved (namely Silva, Sousa, Maurício and Fransergio) and are often bunched together to cause problems for the opposition and to increase the likelihood of a Marítimo head finding the ball first. So if I were a manager and had Marítimo up next, how would I stop them? As they pose such a threat, we’ll commit all of our players back to defending. 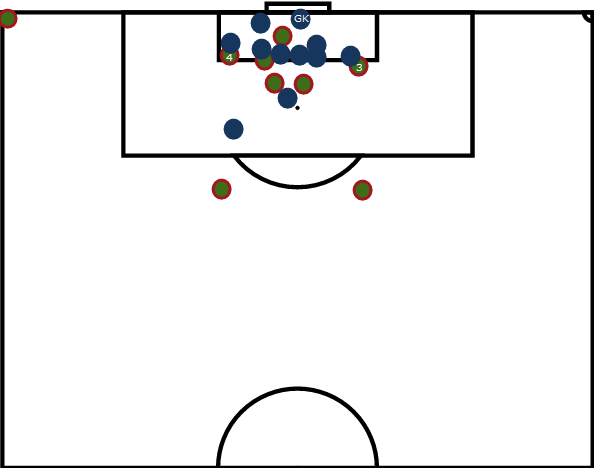 Interestingly Marítimo rarely put more than 6 players into the box for a corner – even when teams put every player back into the box to defend (as seen above in a few of the examples) – this will instantly give us an advantage. The ideal strategy also includes a mix of zonal and man to man marking with players facing different directions. Players labelled as 1 and 2 are sitting on the posts facing away from goal – this puts them in a great position to block any incoming shots if Marítimo do manage to get one away – it also lets them communicate easily to the defenders in front who are watching the ball. 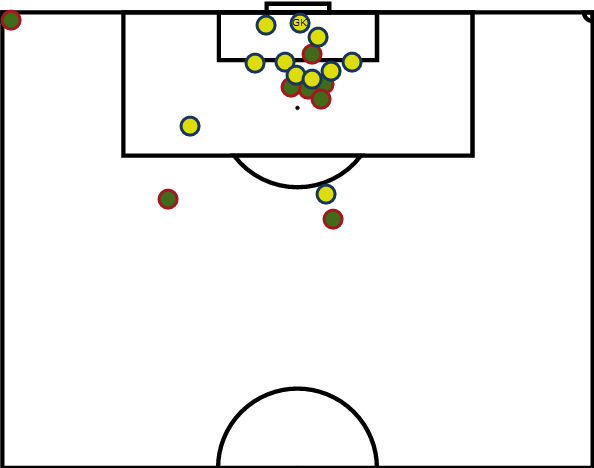 Players 3, 4 and 5 are all zonally marking the 6 yard box where the Marítimo players are likely to attack. Players 3 and 5 are watching the corner taker until the ball is delivered, they then turn to cut off any advancing runs from the bunch of Marítimo players, whilst player 4 is the player designated to watch the ball for the duration. He’s then covered from players 3 + 5 from any blind runs onto his position from the Marítimo players. Players 6-10 are all man marking a select Marítimo player and will track any runs they might make and are matched as closely as possible to the height of the main Marítimo players. This should ensure multiple layers of cover and would most likely be effective at reducing the amount of chances they get from corners. It’ll be interesting to see the stats at the end of the season to see if Marítimo have managed to keep up their quite crazy ratio of corners to goals or if they are indeed an outlier and have been “lucky” and I may well do a follow up piece in a few months time.